This Pet Friendly country Home is privately situated on a 19 acre farmlet with no close neighbours. 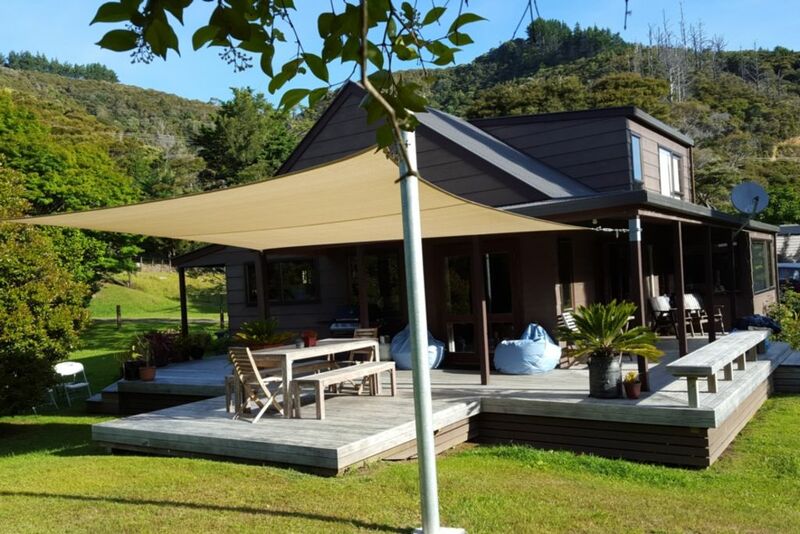 Just 3 minutes drive to the beautiful Kuaotunu beaches, and 15 minutes to the vibrant township of Whitianga with its resturants and amenities. The farmlet has a safe meandering stream to explore, which allows for country as well as beach time. The Hill across the small valley is great for those that may like a daily walk. Born and bred Coromandel folk. A lovely outdoor garden to relax in . The house was comfortable and had all that you could possibly want. The outdoor bean bags were perfect for lounging about in the sun. Large cottage that is very close to nature/bush with plenty of wildlife seen from the garden, and is <5 minute drive to the beach. Had everything we needed for a great holiday. Great Bach in a beautiful, peaceful location. Tte property was great, particularly with two dogs. The house was in good condition and was well equipped. Kuaotunu is a special community, which has a laid back relaxed atmosphere. The local shop can provide any supplies needed. Central to both the east and west sides of the Coromandel Peninsula. Bring your Fishing boat, paddle boards for the Whangapoa harbor, sea kayak for the coast line, hiking boots for the coast walk, or just your togs and a sun umbrella for the many white sand beaches.